Despite mammoth efforts to increase revenues and productivity, the U. S. Postal Service has failed to make a profit in years. In fact, this year it’s expected to run a deficit of over $5 billion. The difference is made up by the Treasury — that is, the American taxpayer. Benjamin Franklin faced a similar challenge when he was made America’s first postmaster general in 1753. Within four years, he reformed the Crown’s mail service from an unreliable, expensive and unprofitable service to an efficient, dependable and rewarding operation. And in doing so he helped make the 13 colonies come together as a nation. What was his secret, and what we learn from his experience today? First, some background: The colonial post office was run by the British Crown, which appointed local postmasters. The royal mail was expensive, slow, erratic and limited to major towns. It was discriminatory — government officials like the Penns had the franking privilege (free mailing service). So did the local printers like Franklin, who was appointed postmaster of Philadelphia in 1737. Their newspapers could be circulated for free. And mailing letters was expensive, limiting its use to the wealthy, businessmen and lawyers. Few colonists could afford to mail letters through the official royal mail. Finally, mail delivery was slow. A letter from Boston to Philadelphia might take six weeks to arrive. There was no centralized network to transport mail. How did Franklin transform the post office? First, he lobbied for the job, and won it because for 16 years he ran the post office in Philadelphia. His experience paid off. His first action was to make a grand tour of the postal service. Like a true scientist, he felt is essential to have firsthand knowledge of the mail system, and within a few months after his appointment, he went on a ten-week inspection tour of New England from New Jersey to Massachusetts, to determine the problems facing the post office (poor roads, bad record keeping, etc.). He talked face to face with riders and postmasters, responding to suggestions and improvements. After his grand tour, Franklin immediately went to work. On the post roads, he had milestones erected to help riders pace themselves better. (These milestones still exist between Boston and New York.) After consulting with local postal workers, he suggested new roads, fords and ferries to deliver the mail faster and more regularly. 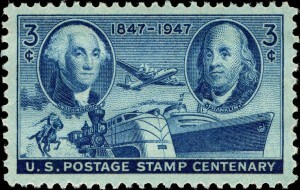 As a result, he was able to reduce the travel time for mail between Boston and Philadelphia from six weeks to three. Within a year, he had cut the delivery time of a letter between Philadelphia and New York to one day. Franklin insisted on precise record keeping. When he started working for Andrew Bradford, who published the town’s only newspaper, he noticed Bradford was irregular in his accounts. To deal with this problem, he furnished a uniform system of accounts to all postmasters throughout the colonies, and insisted that all postmasters keep precise accounts of their revenues and costs. In his old newspaper the Gazette, he had for years printed the names of persons who had letters waiting for them, and introduced this practice in other post offices. Too often, letters were allowed to lie around or read by friends. Franklin discontinued the practice in Philadelphia, and imposed the same regulation in the rest of the colonies. He also introduced home delivery and the penny post. If individuals failed to pick up a letter after their names were published in the newspaper, letters would be sent the next day for an additional fee. Franklin encouraged the same local delivery in other large towns. Unclaimed letters after three months were forwarded to the central office in Philadelphia. Thus Franklin has another claim: inventor of the dead letter office! Franklin also made the post office egalitarian. He reduced the price and expanded the service for all colonists, not just the wealthy or important people. He abolished the monopolistic practice of allowing local postmasters to distribute newspapers for free, and opened the service to all papers for a small fee. Franklin was never one to maintain monopoly power. For example, he never trademarked any of his inventions. He thought they should be made available to everyone for their benefit, whether it be the Franklin stove, the lightning rod, or bi-focals. All these improvements in the postal system under Franklin cost money. It cost him and his partner, William Hunter, a great deal, and they incurred £900 over their first four years. But by the fourth year they collected more money in twelve months than it had in the previous thirty-six, earning a profit of £300 a year apiece. It remained profitable until the Revolutionary War broke out. On this 4th of July, it is entirely appropriate to remember Benjamin Franklin as the father of American capitalism. 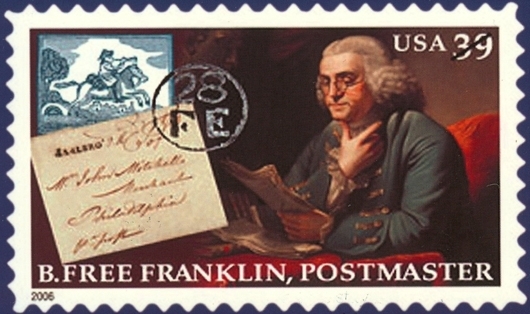 The post office has honored Franklin with his image on more stamps than any other person other than George Washington. Mark Skousen is a Presidential Fellow at Chapman University, editor of Forecasts & Strategies, and producer of www.freedomfest.com. This article is based on a column written for the Franklin Prosperity Report and appeared on the Newmax website: http://www.newsmax.com/Newsfront/ben-franklin-saved-post/2016/07/03/id/736842/ with comments from readers. I never knew about that. Great story! I’ll think about Franklin the next time I pull a pile of coupons and advertisements out of my mailbox. You’re so cool! I truly do not believe I’ve read anything such as that before. So nice to learn somebody by incorporating original thoughts on this topic. Really.. thanks for starting this up. This website is a thing that is required online, someone with a little originality!